Philadelphia, PA — Independence Health Group (Independence), parent of Independence Blue Cross, today announced that Walter D’Alessio is retiring as chairman of its board of directors and will be honored with the title of Chairman Emeritus effective July 1, 2018. 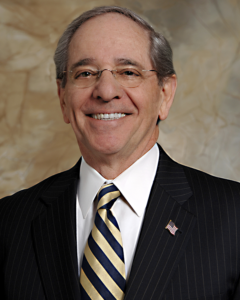 The board formally elected vice chairman Charles Pizzi as its new chairman. During his chairmanship of Independence, D’Alessio helped navigate the company through the complex issues and challenges of the health care system and the uncertainty of health care reform. Most recently under D’Alessio’s chairmanship, Independence forged groundbreaking partnerships with best-in-class organizations to advance health care innovation, such as Penn Medicine and Comcast, and he has played a significant role in Independence’s growth. Additionally, he has continued to advocate for better patient care and helped launch Independence’s Facilitated Health Networks model aimed at transforming healthcare delivery so members can receive quality, affordable care. D’Alessio also understood the importance of empowering members with customized digital resources to enhance their overall experience and promote healthier lifestyles, which is evident by the success of IBX Wire and the Achieve Well-being platform – both launched under his time as chairman. Born and raised in western Pennsylvania, D’Alessio earned a bachelor’s degree from Penn State and a master’s degree in city planning from the University of Illinois. D’ Alessio set his sights on Philadelphia and quickly became one of the city’s greatest advocates and civic leaders. He has played a major role in Philadelphia’s urban planning and renewal and has championed some of the region’s most influential development and redevelopment projects. D’Alessio has more than 45 years of experience in planning, developing, financing and managing major real estate projects in Philadelphia, including 12 years (two years as executive director) with the Philadelphia Redevelopment Authority and 10 years as the executive vice president of the Philadelphia Industrial Development Corporation (PIDC). In addition to his role at Independence, D’Alessio currently serves as principal of NorthMarq Advisors, LLC., and formerly served as Senior Managing Director of NorthMarq Real Estate Services. Prior to that, he was chairman and CEO of Legg Mason Real Estate Services from 1982 until 2003, when the company was sold to NorthMarq Capital. D’Alessio is a member and officer of several national professional associations. He is also active as a member, director and officer of PECO, Philadelphia Industrial Development Corporation, Greater Philadelphia Chamber of Commerce, Ben Franklin Technology Partners of Southeastern Pennsylvania, and FS Investment Corporation. Independence Health Group, together with its subsidiaries, serves nearly 8.5 million people in 29 states and the District of Columbia, including 2.5 million in southeastern Pennsylvania. In addition to a growing consumer business, Independence serves employer groups ranging from small businesses to national corporations. Headquartered in Philadelphia, Independence Health Group is a diversified company offering a wide range of services including commercial, Medicare and Medicaid medical coverage, third-party benefits administration, and pharmacy benefits management.